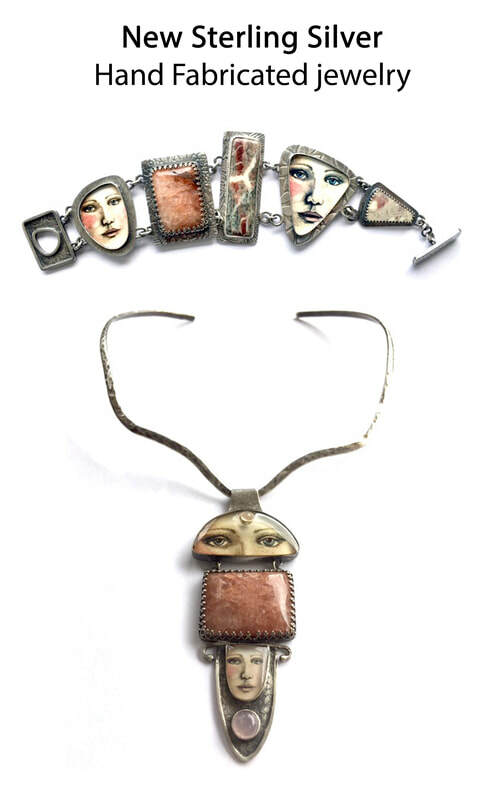 For the pewter jewelry Laurie uses miniature reproductions of her watercolor paintings 'set' in settings cast from her original clay models. The sterling silver is handcrafted one piece at a time in Laurie's new metalworking studio. She uses silver sheet and wire, a rolling mill, saw, torches, hammers and other fun tools. I've always been an experimenter and am primarily self taught in all aspects of my art. I needed a little help and a little push to take on this new challenge. Thank you to my good friend Janet Brum for your patient mentoring and encouragement! This has been so much fun as I am playing and learning different techniques. This silver jewelry will only be available at my art shows for right now. I am using a rolling mill to press the texture into the metal then forming it with saws, hammers and other fun tools. Soldering, fusing, and otherwise melting the metal to bend it to my will, LOL.